There is a high degree of skill in printmaking, particularly—in the case of relief printing—the carving of the vehicle. I, for one, have tried relief printing, both linoleum cuts and woodcuts, and I am not dexterous enough to produce either fine line, or smooth contours of shapes (like the oak leaf in the Albee print). In many ways, printmaking changed from the 1800s to the 1900s in that artists started carving their own surfaces rather than handing a drawing over to a professional printmaker. There is a grace and sophistication to Albee’s prints to which I just awoke (go figure, I awake to new and exciting art every week!). She is yet another example of a woman artist who slipped under the radar of most art history surveys, except for mine! Wood engraving is a relief printmaking medium, in which the design is carved out of a wood block. It is an ancient art form. Ancient Egyptians used wood engravings to stamp designs on fabric. The ancient Romans stamped designs in brick and terra cotta. The Chinese were producing wood engraved prints long before Europe. Wood engraving was first used in the West to produce devotional prints and playing cards. The heyday of the medium was the late 1700s through the 1860s, when the medium was used to illustrate books and magazines, and to reproduce paintings for mass consumption. By the late 1860s, the medium was eclipsed by lithography, a much simpler process. Drawings did not need to be transferred to a wood block and carved. The artist could draw the design directly on the litho stone. Wood engraving enjoyed a revival in the early 1900s as a fine art medium in its own right, rather than illustration for other works. 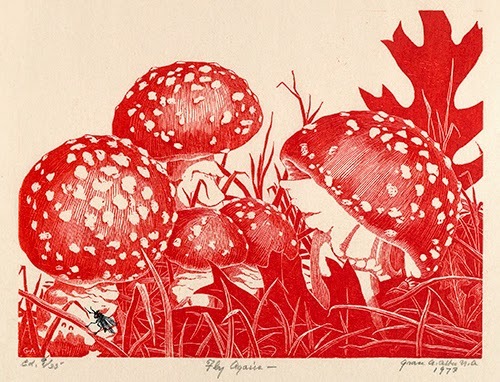 As a child, Albee was fascinated by the wood engraving illustrations in her grandfather’s books. Although she studied painting at the Rhode Island School of Design, wood engraving became her primary medium as a mature artist. Like the majority of artists working with wood engraving in the 1900s, Albee carved her own woodblocks. After marrying, Albee and her husband lived in Paris from 1928 to 1933. There she met the engraver Paul Bomet, with whom she took lessons in wood engraving. She had her first one-woman show in Paris in 1932. Between 1933 and 1937 Albee lived in New York, where she produced primarily prints of urban scenery. After moving to Doylestown, PA in 1937, she began producing the prints for which she is best known, close-ups of nature. This subject matter remained a part of her oeuvre the rest of her life. Albee produced over 250 prints during her career. They are mostly small in scale because she preferred carving on the end-grain of the wood block. This required high precision in carving, producing extraordinary detail, obvious in this print of the fly argaric mushroom. 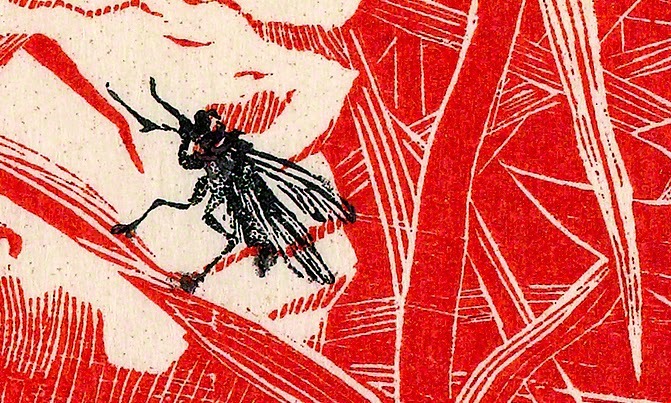 In this print she has cleverly placed a fly in a contrasting color to the whole in a play on words. Studio Activity: A nature relief print. Make a one-color relief print on a linoleum block using linoleum cutting tools. Choose as subject matter an element of nature such as a plant, grass, or the side of a tree. Make sketches to practice, and then sketch on the linoleum block. Make a note which areas will be printed in the one color. Remember that the areas that receive the color remain raised. Simplify the shapes so that the carving of the linoleum does not involve a lot of detail. Carve away the linoleum that will form the white background or outlines of shapes.